When you really, truly, deeply love gardens you are inspired to share this love with all you meet. 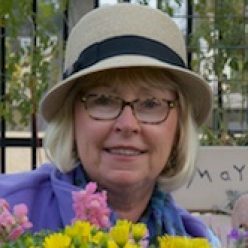 When your work in landscape design spans 40 years, while earning you and your landscaping firm 250 design awards, recognition from three US first ladies, (Johnson, Regan, and Carter) and every day you have ideas about what you would like to grow, why not make a garden as a gift to the land you love? Create the garden on land in the south, where your family has deep horticultural roots, where your grandmothers passed on their love of gardening to you. Seriously, why not? 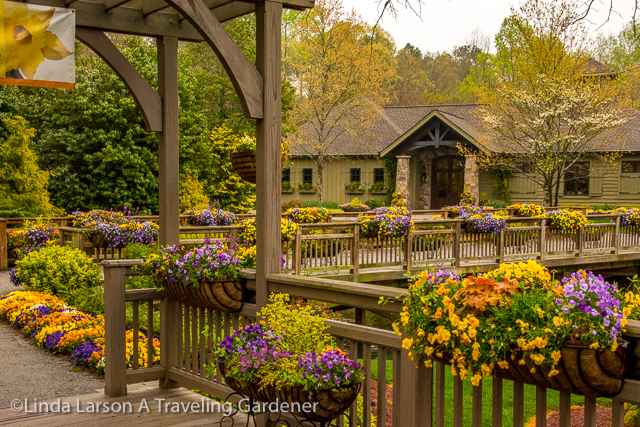 Meet Jim Gibbs of Gibbs Gardens, located in the foothills of Mt. Oglethorpe, in north Georgia. This garden rivals the beauty of Butchart, Sissinghurst, and Monticello. 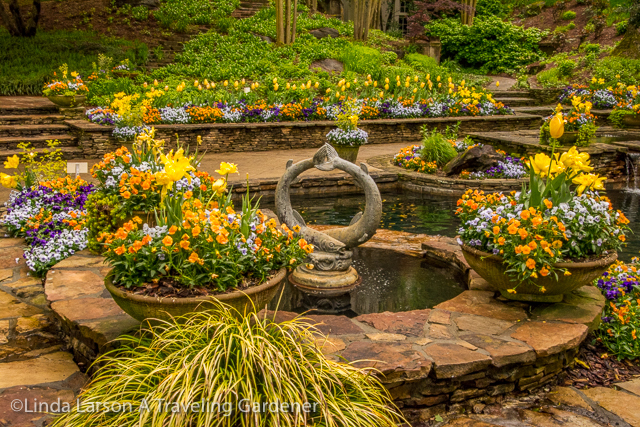 This is a destination pleasure garden designed and developed over 30 years by a master of landscape art. If you haven’t heard of it yet it isn’t because you aren’t paying attention. It has only been open to the public since 2012. But now that you know, all you have to do is decide when you want to visit. 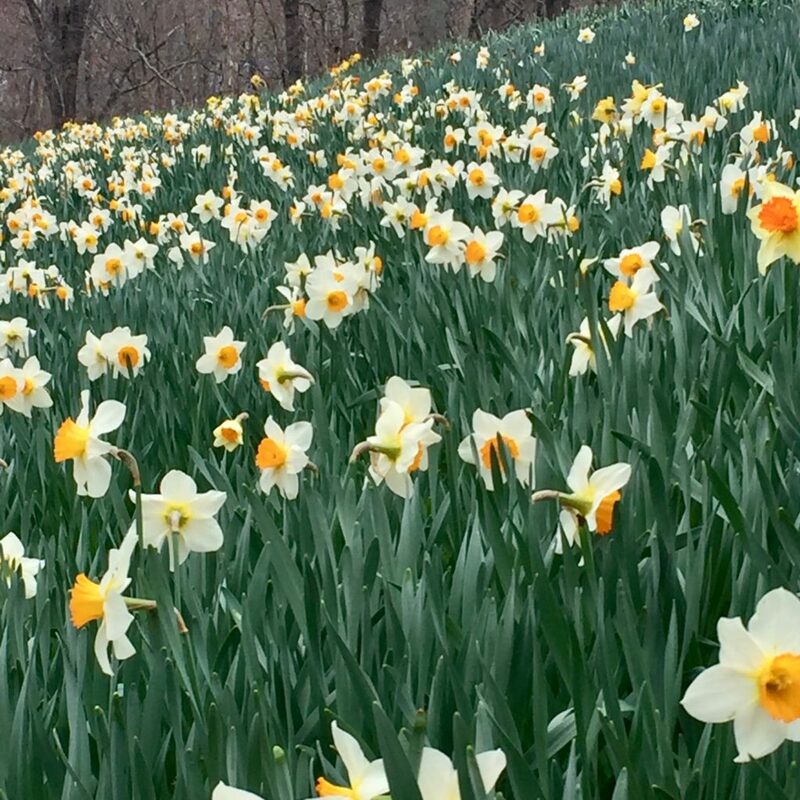 You might want to go in early spring for the daffodil festival when 20 million daffodils of 60 varieties open between March 1 and April 8. If you don’t make it then, the spring lingers with cherry blossoms, Dogwood, and the leafing out of 2000 Japanese maple trees. 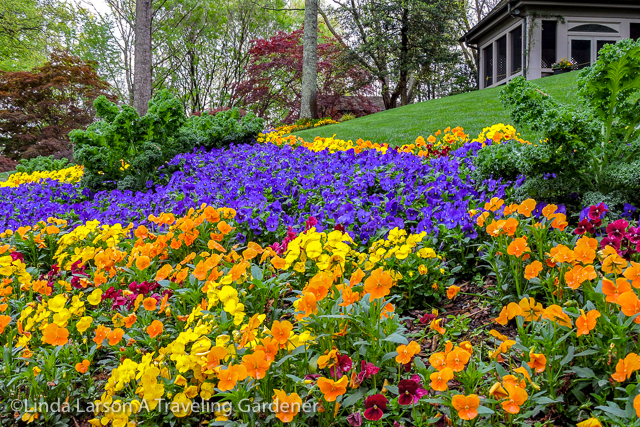 The garden is known for the mass color spectacular of annuals. 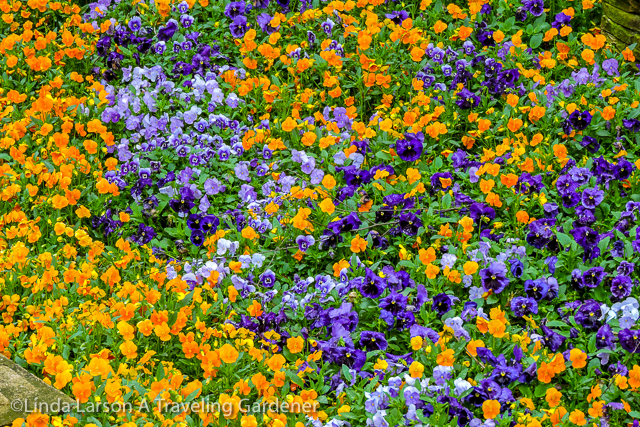 On my first visit here, the color scheme was orange, blue, and yellow with pansies as the dominant flower. 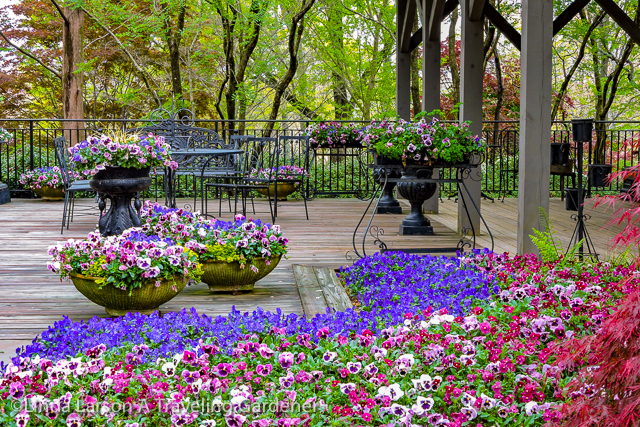 The long entry was filled with hanging planters along the railing, overflowing with pansies and the blooms repeated in containers and in ground beds. 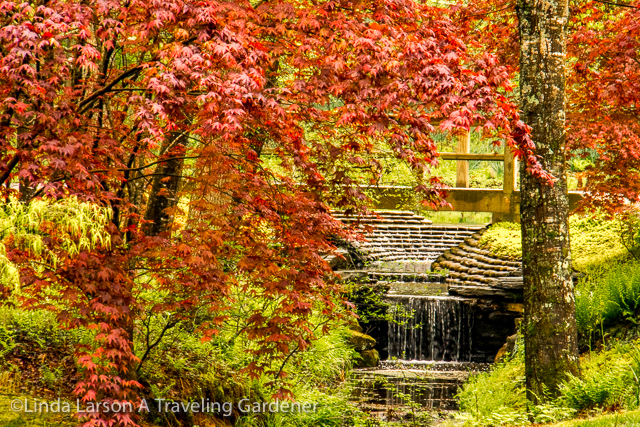 You enter the Valley Gardens through an allée of 120 red sunset maples emerging at the end to view the first of 24 ponds. From there, the views open up for the valley gardens. Even in summer, you will walk under a canopy of shade alongside ponds and cooling waterfalls. 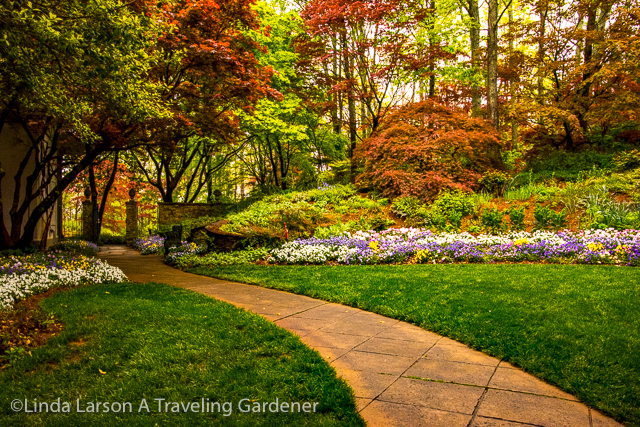 This garden is uniquely beautiful precisely because of the location and topography of the land. 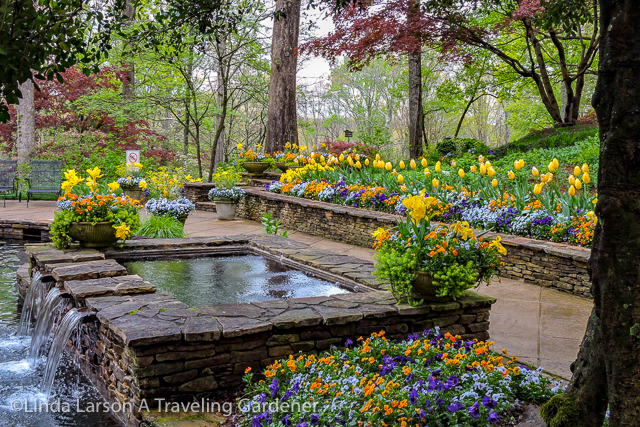 Jim looked for six years to find the property that would allow him to design a garden that would provide the visitor with a feeling of “walking through a flower arrangement.” (website) There would be beauty above you, below you, and around you. The mature forest provides the highest canopy, with natural streams directed through the grounds. 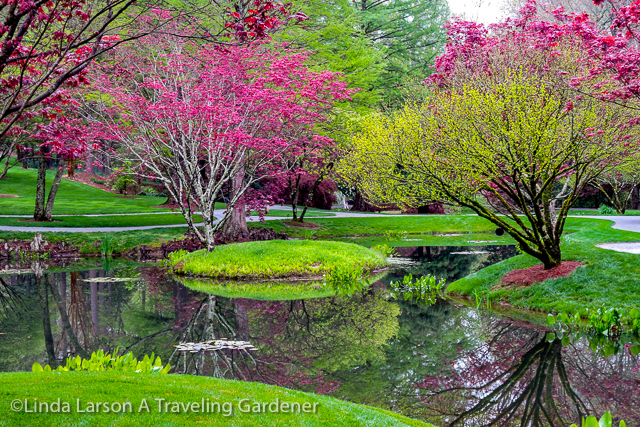 The understory of the Japanese maples provides vibrant color spring, summer, and fall. The Manor house garden is set on a hill and surrounded by seven levels of terraced gardens designed to be wandered through as you gradually ascend the 150 foot (46m) rise. Pale pink roses climb up the long arbor establishing the entrance to these gardens. Patio, pool and conservatory spaces repeat the mass planting in coordinating colors. Each view here is carefully designed to delight your eye. This is the Gibbs family home, it conveniently allows Jim to continue to fine tune his garden and certainly enjoy the beauty he has created. 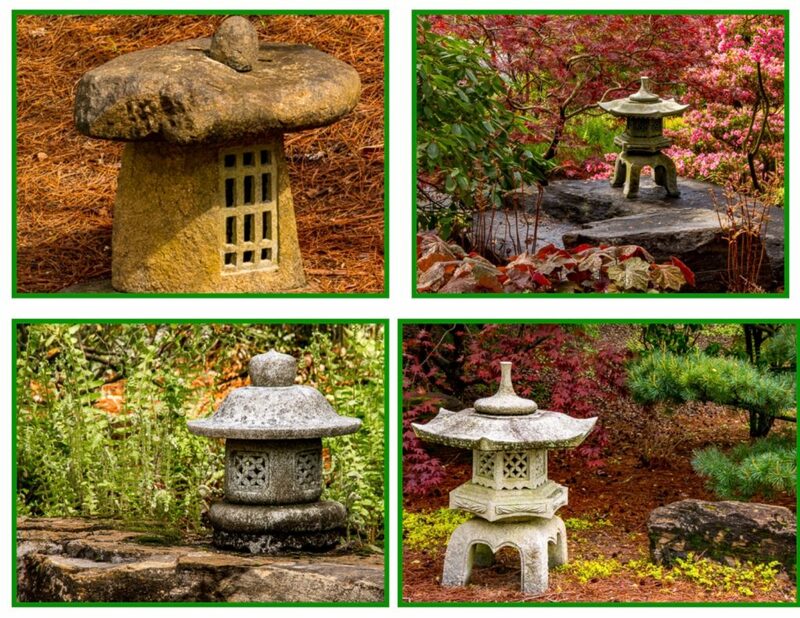 Years ago after an apprenticeship in Japan to study the art of Japanese Design, he resolved to build his own Japanese Garden. 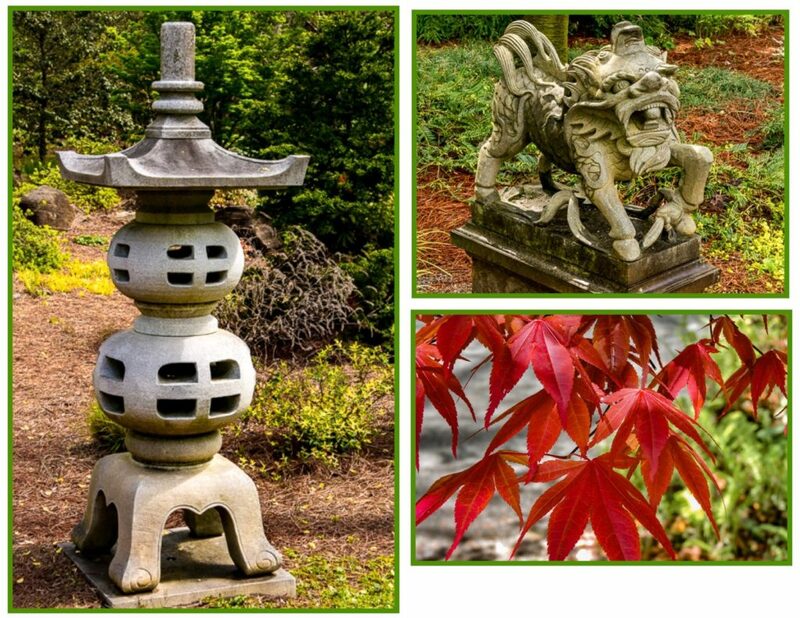 He thought big and built a 40 acre Japanese Garden, said to be the largest in the US, with a collection of stone lanterns and buddhas varying in style from the grand to the whimsical. 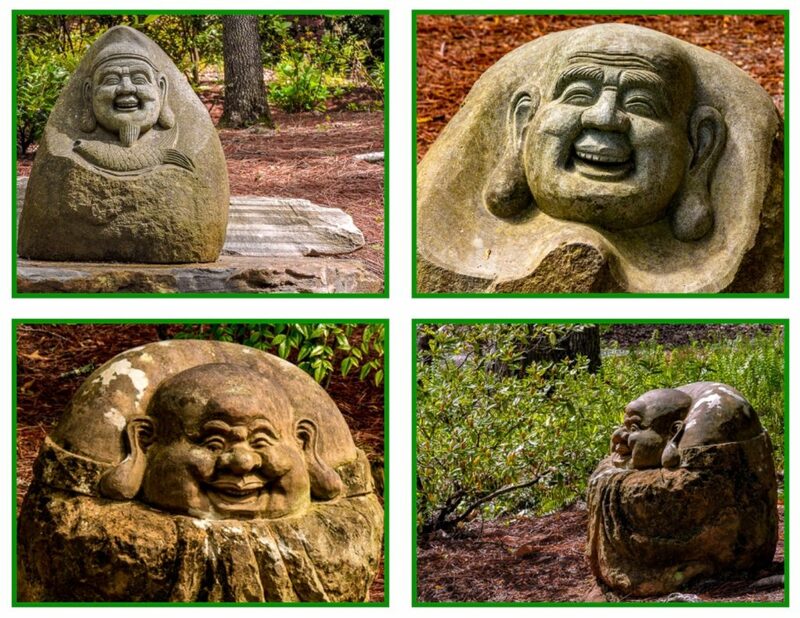 He has written that finding the perfect boulders for his gardens was a five-year search over five countries. If you can’t visit in the spring, consider the Waterlily festival in late September. The waterlily collection is planted in five ponds with 140 varieties of leaf shapes and blooms. Autumn, mid-October into November, is a kaleidoscope of color to enjoy the changing colors of the Japanese Maples and the forest canopy. The only time you can’t visit is from mid-December to March 1 when the gardens are closed. 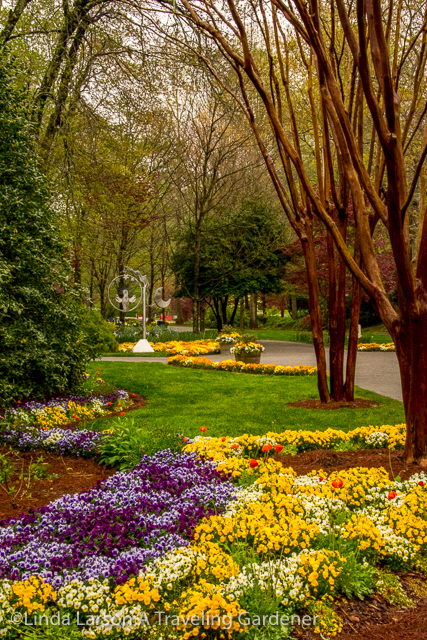 But any other time there will be beauty enough to immerse yourself in this garden. 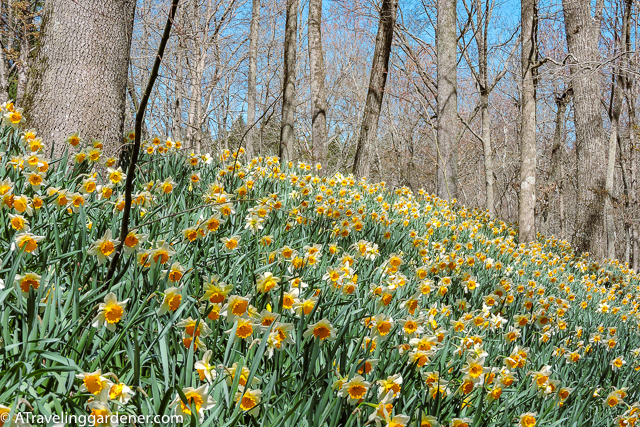 I’ve made it back for a second visit to see the waves of daffodils sweeping across the land under the trees. I’m coming back to see the garden in the fall. Spread the word, this is a grand garden, this is an emotional experience of nature, this is a gift to all who love gardens. Don’t miss it. “The flowers she grew with it you would not believe,” Gibbs said. Oh, my goodness, Linda! Each of your letters to us is lovelier and more thoughtful than the preceding ones. 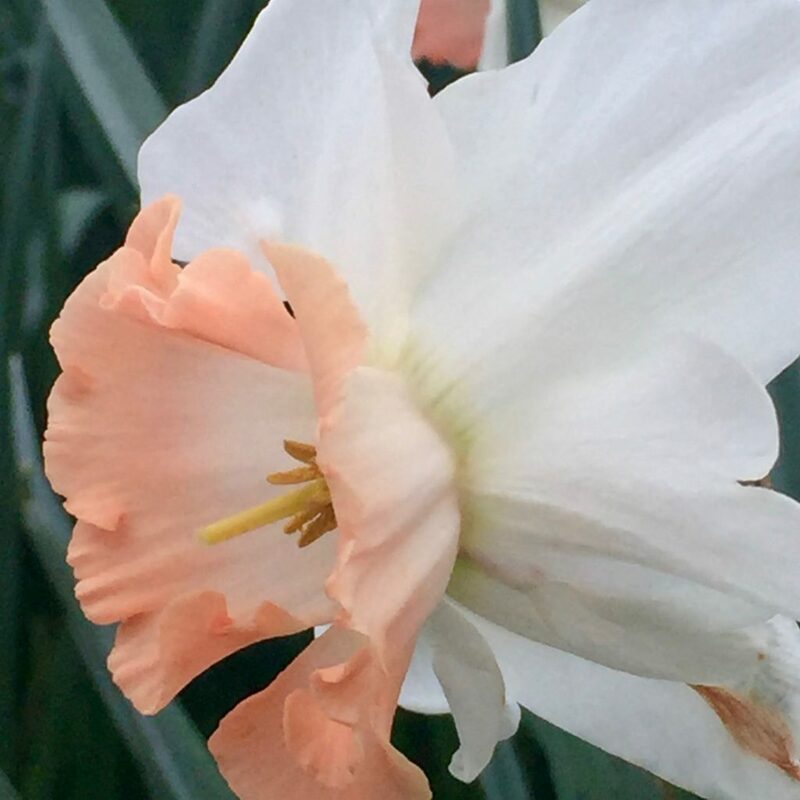 Like daffodils, you get better and better each time you bloom! Thank you for sharing your world — and insights you glean from that world — with us. P. S. To your readers: Linda will be speaking to the Osher Lifelong Learning Institute in Terre Haute, Indiana May 23rd. If you’re in the neighborhood, plan to be there. Her public speaking is as outstanding as her blog. Wow! And I lived in Atlanta for years and never knew (but then, it only opened in2012). You’re correct, I am reminded of Butchart Gardens! Thank you for sharing…cheers from Newport! It is worth a visit! This is an American Gem! Thank you, certainly an inspiration to keep on gardening. Thank you so much for the wonderful information you give! Thank you for traveling along . . . . I want to be there! Adding to my list. Pass the sweet tea, please. What a beautiful garden. I can almost feel like I am there. I appreciate that pictures are able to enlarge without taking it out of the text. It is easier to focus in without losing my place. Thanks for reading and traveling along with us. Stunning, beautiful. Having spent time in Tennessee years ago, I know how lovely spring can be. Spring has a variety of meanings. . . .we were in snow flurries when we arrived on this visit. This garden defies description. What words to use? These photographs are all from Rich? Thanks to both of you for bringing this to my screen. Not like seeing it in Georgia, of course, but something I’m happy not to have missed. 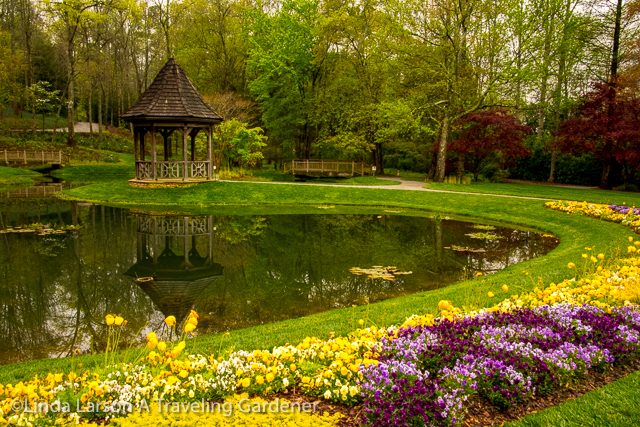 Linda, I enjoyed meeting you and Rich today at Gibbs Gardens. Thank you for your wonderful description of our “best kept secret in North Georgia.” It is a beautiful place to work and the staff is like family! I look forward to seeing you again when you visit our gardens. It must not be a secret! 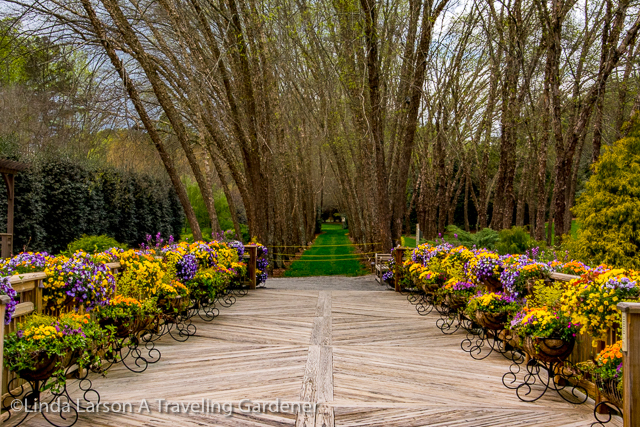 It is such a beautiful garden . . .I hope to come back in the fall. I wish I could have met you today, I’m working with enormous size grading equipment on a new garden venue overlooking the 350 acre lake on the east end of our 326 acre property. I enjoyed your article and pictures, you’re a great writer and you and your husband are super photographers. 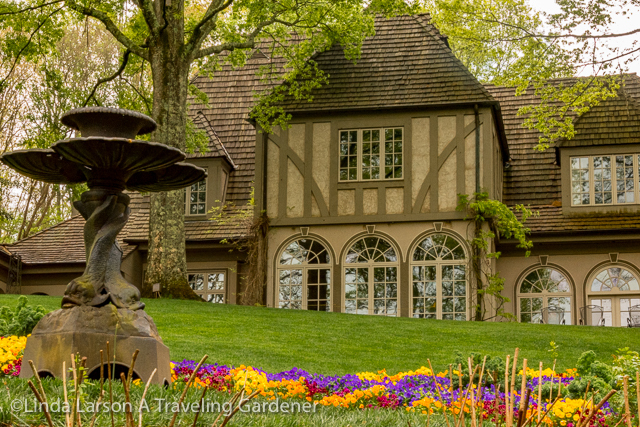 Thank you for visiting Gibbs Gardens and spreading the wonderful publicity. We will all look forward to your next visit. A garden is fresh and alive from early dawn to the peace and tranquility of the setting sun. Your garden is such a beautiful place I love visiting it. My goal is to get people to spend more time in a garden especially when traveling, I believe a garden gives us the best view of our world. I’m delighted you enjoyed our photos and description of your masterpiece. Feel free to share it with others. I’ll be in touch before I come for our next visit! you find another “lovingly created” place on earth to touch us with wonder and awe. Thank you is not enough. and view all of God’s beautiful plants in wonderful gardens. Incredibly beautiful place! Thanks much for revealing it to us. Previous Previous post: Peace & Tranquility in Washington D. C.
Next Next post: Daffodils, Jonquils, Narcissus, Oh My!